The project has been exhibited at the Evandale Arts Centre in Gold Coast, Australia in November and December 2013. The main concept for the new Gold Coast Cultural Precinct is to free the greatest possible area from the imprint of buildings and parking to create an extensive, epic landscape perfectly merging with the new building. A first volume, 94x94 meters, will be build around and on top of the existing Arts Centre and will host the new Living Arts Centre. The platform on top of it, at level RL 24.6, will become an outdoor Green Terrace for cultural and recreational events. It will be connected with the ground floor (in addition to escalators and elevators) also by a pedestrian ramp starting from within the Artscape. 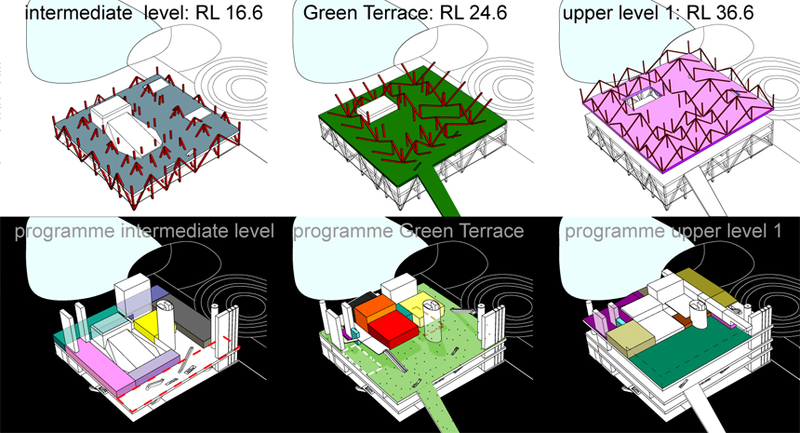 A second volume of 94x188 meters will be placed above the Green Terrace from level RL 36.6 to RL 48.6. The part above the first volume will be dedicated to the functions of the new Living Arts Centre, while the hang-over part will host the new Floating Arts Museum. Two bridges, placed at the far ends of the protruding volume, will have a threefold function of supporting the hangover, hosting cultural facilities for the community and allowing access to the Sky Terrace on the roof. 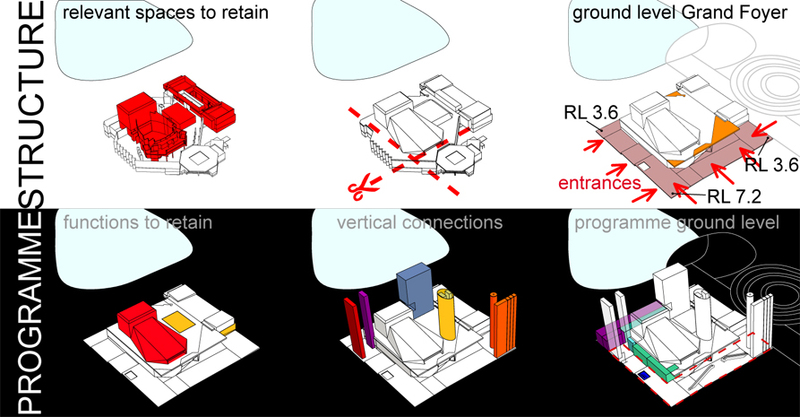 In addition to making the intervention economically and ecologically sustainable, the insertion of the new structure around and above the existing one will free up the area and create visual and physical permeability, so visitors can enjoy views of the new beautiful Artscape, the Nerang river and waterways system, and the Surfer's Paradise skyline. Under the cover of the Floating Museum, at ground level, the Golden Terrace will be created which will act as a catalyst for large-scale outdoor public events. Between the Golden Terrace and the lake, an amphitheater (with steps/seats looking towards Surfer's Paradise) will satisfy every other need of space for large events. The 900 required parking spaces will be placed underground (2 floors). In the structure of the parking, geothermal probes will be installed to create an “active structure”. This solution will supply energy to heat pumps to provide air-conditioning to the whole complex. In the area above the parking solar modules will be installed to supply the heat pumps. The Artscape is divided into stripes that guide visitors both visually and physically to focal points of the area. They create a series of landscapes and atmospheres that recall the subtropical Australian flora. A curved path (for use by both pedestrians and bicycles) intersects the stripes of the gardens creating cross-connections between all areas of the Artscape. 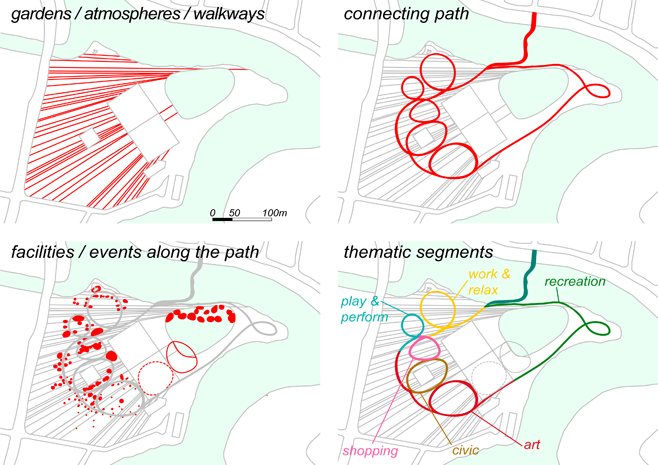 The path is divided into six thematic segments, with activities and facilities spread along it. The visitor can venture away from the path into the landscapes to discover hidden, surprising elements. 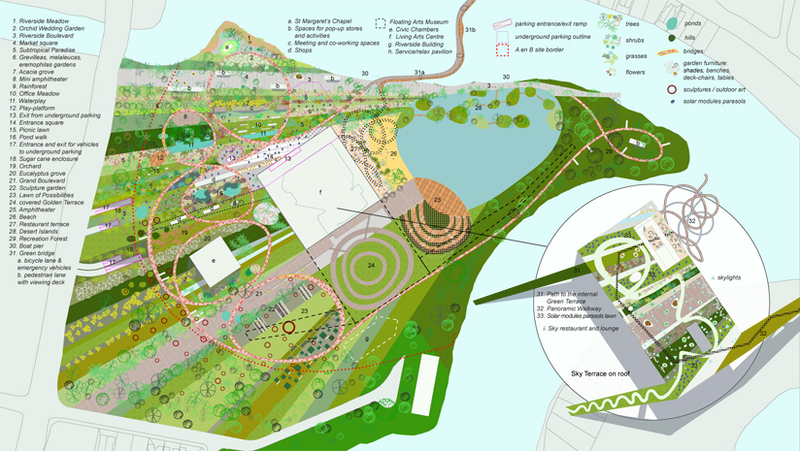 A scenic walkway from the north-east end of the Sky Terrace leads to the ground and joins the curved path and the green bridge connecting the precinct with Chevron Island. By clearing the area of buildings and parking on the ground, and increasing the amount of landscape surface (by way of the two elevated terraces), a precinct can be created that will enrich the Gold Coast and become the focal point of the cultural and recreational life of the area.